HOUSTON – Upon entering The Station Museum of Contemporary Art on the edge of the city’s downtown to view the exhibition “Iraqi Artists in Exile,” I was hit with the questions “How do we justify the destruction of a country and her people? What do we say?” This wonderful museum is renowned for its thought provoking exhibitions. This phenomenal exhibition has not been placed at any other museum in the United States due to its controversial nature. The exhibition evokes feelings of what oppressed people around the world are experiencing. The first piece you see upon entering is a man disrobed with his hands bound and his head completely covered by a bag, and he is sitting in a very vulnerable position. This sculpture symbolizes the subjugation of the Iraqi people under the occupation. By some estimates, more than a million people, mostly women and children, have been killed since the 2003 invasion. While viewing “Iraqi Artists in Exile,” you cannot help but feel the helplessness that comes from someone knocking down the doors of your home and forcing themselves in and kicking you out. One sixty-five year old Iraqi artist had all of the art that he had created over four decades destroyed. His home was leveled and he was exiled from his country. He said “I must start over.” The one thing that he is holding on to is hope. Before the U.S. invasion, Baghdad was one of the cultural centers of the world. 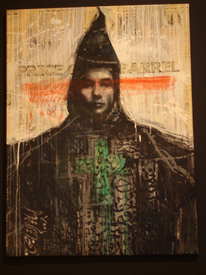 Like the U.S., Iraq is ethnically and culturally diverse and this is reflected in the exhibition. There were libraries and museums containing historical documents and works of art that were seven thousand years old. These ancient libraries and museums were looted, pillaged and turned into rubble as a result of the occupation. Within these institutions were librarians, curators, and museum staff. All of these tragedies are dramatized by the exhibition, to include the traumatized state of these people, the destruction of their lives, their jobs, their art and their history. Another theme of the exhibition reveals the true reason for this unnecessary war: a fight for oil and imperial dominance. The use of religious fundamentalism to justify warfare was also highlighted. There is also a reference to the heavily publicized prison atrocities in Abu Ghraib that became the face of the occupation. One artist reminisces about a mother he met and her response to seeing the photograph of her tortured son in prison. She said she wept as if she were the Virgin Mary looking at her crucified son. The exhibition forces one to consider the question, “Could this happen here?” The great, collective hope is that the occupation of Iraq will end and the world can embark on positive policies that will move us forward. Bernadette Steward is a graduate student at Texas Southern University.